Every now and then you learn something about a relative that makes you cringe. You may have heard of the Chinese Exclusion Act, but didn’t you know that in the early 1900s, a wave of anti-Japanese fervor swept through California? On March 6th, 1905, the San Francisco Chronicle dedicated a whole page to the “Japanese problem”. Page 4 of this issue has a large headline stating “Unanimous for Japanese Restrictions”. 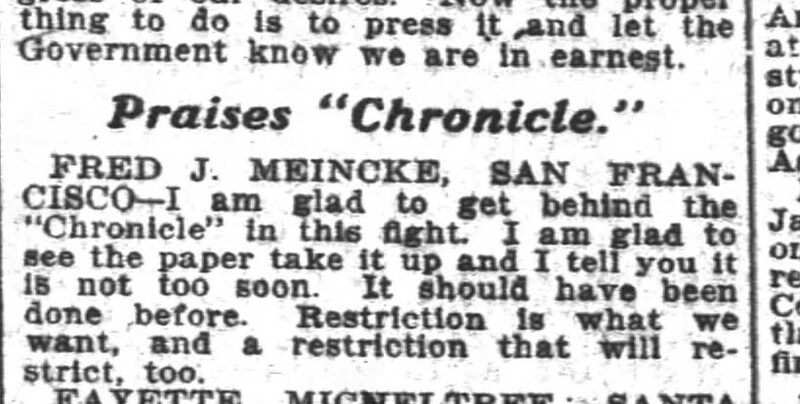 The page had a newspaper editorial as well as letters from several members of the state legislature showing their support for keeping Japanese immigrants out of California. The resolution asked that the federal government get involved and work towards ending or severely restricting Japanese immigration. It called on the state’s Senators and Representatives to act on their behalf with the President and the Department of State. I read through many of the letters and I was surprised when I saw the name “Fred J. Meincke”. Fred was the son of Mary (Kelly) and Frederick Meincke Sr. Fred was my Great Grandmother’s first cousin. He had been elected to California State Legislature in 1904 as a Republican for a district in San Francisco. He served until 1911. My relative’s letter was mild in comparison to some of those written by his colleagues. And on and on go the letters in support of the resolution. This was equal opportunity discrimination. All of the legislature, Democrats (their were 4 in the Assembly) and the Republicans made their support public. Through the letters their was a common thread that the Japanese were taking over the labor market. There seemed to be a deeply rooted fear that thousands of Japanese immigrants would soon flood California when the Russo-Japanese war ended. The war began in February of 1904 and continued until September 1905. It appears politicians were terrified that these tired soldiers would look to California, see how well their compatriots were doing, and then leave Japan in droves. In 1906, the San Francisco Board of Education acted. They segregated the schools. The Japanese, and all other Asians, would be taught in separate schools than other children. There were already Chinese schools. These became “Oriental schools” and all Asian children were sent to them. It appears that the Californian government were in part successful in affecting policy. In 1907, Japan and America came to an agreement on immigration. It was called the “Gentlemen’s Agreement of 1907”. The agreement stated that the US would not limit Japanese immigration, but Japan would not allow any more passports to be issued for those wishing to work in the US. It is interesting to note that Japan continued to issue passports for Hawaii, which was then a US territory, but was always in need of laborers for the various plantations. The Gentlemen’s Agreement was never ratified by Congress. However, Theodore Roosevelt was a supporter and it became the official policy of the US towards Japan. That policy ended in 1924. When Congress passed the Immigration Act of 1924, all Asian immigration was effectively ended. This one letter from my Great Grandmother’s cousin has enlightened me to the racial tensions that existed in the early 1900s. I knew that some of my Portuguese cousins from Hawaii who married Filipino, Chinese, and Japanese people had a rough time when the settled in California. I remember when doing interviews the comments my Grandfather’s cousins made about “those” Pacheco’s from the islands. I remember one woman telling me that the children “looked strange” and that “it wasn’t right”. If their own cousins expressed such thoughts, how did strangers react? I remember one cousin telling me about life on her Grandfather’s farm. He hired Japanese workers and she often played with their children. One day at school, she was asked her nationality. She was very young and didn’t really understand racial terms. She answered “Japanese” and was punished for it. That was around 1928. It’s not difficult to imagine the difficulties these folks experience. After all, interracial marriage might have been acceptable in Hawaii, but it wouldn’t come to California until the late 1940s. The Chinese Exclusion Act of 1882 was the tip of the iceberg. Racial tensions would continue to increase until they reached a fever pitch. Footnote.com has copies of the San Francisco Chronicle. If you have access to Footnote.com, you might like to look up the March 6, 1905 issue for more letters and editorials on this issue.